Happy IWSG Day! 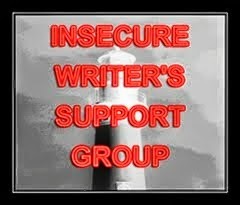 The Insecure Writer's Support Group posts every first Wednesday of the month. Check out the group here. Our co-hosts for March are Chemist Ken, Suzanne Sapseed, and Shannon Lawrence! Thanks guys! Once upon a time, I couldn't write an original character without that character being, basically, based on one of my friends. Book the First, in particular, is rife with characters who are not-very-loosely-at-all based on my closest friends. Since then, I've stopped basing characters on people I know directly and actually invent characters, one of my favorite parts of the whole writing thing. My friends don't, for the most part, fit the things I'm writing now anyway and because I'd still like to have friends, I leave them alone. But still, I'm a writer and one of my favorite writer sayings is Be Careful, You Might End Up in My Novel. Writers take from real life and insert things into their work. It's the way it is, peeps. And sometimes--not often, but once in a blue moon--I get insecure about how close a character is to me or to someone I know or if the character is good or bad or interesting or dead boring. In my new project, in the modern day portion, there is a character who vacuums his outdoor patio. Anybody who knows me knows that I have a neighbor who vacuums his little backyard--yep, outdoors--and it's annoying. It's too weird not to use in fiction, right? I'm trying to decide why this character vacuums outdoors. He's gotta be OCD, for sure, or maybe he cleans to distract himself or he's one of those people who finds cleaning to be relaxing? I'm not really sure--so I'm a little insecure about the reasoning I gave to this character as to why he does this. So, what kind of little real life bits have you inserted into your projects? Do you feel insecure about your characters sometimes? Though I was thinking, does he need a reason to vacuum outside? Part of the hilarity of the situation is that it makes absolutely no sense at all. His purpose in the story could just be comedic reasons, and it relates to anyone who has had an insane neighbor! Real Life Porch Guy vacuumed his patio last night--even though we had freezing rain and sleet coming down. Lol! Really, a leaf blower? All of them. I write realistic fiction. You have to observe life to write it, and if someone sees herself or himself in my work, so be it. You are like Dr. Frankenstein, taking a quirk here, an obsession there, and mixing it into a character. Fun stuff. It IS fun. Sometimes I'll just be writing and a character will exhibit a trait or a preference and they come to life. Best thing ever. I take little quirks from people I know and insert them in my stories all the time. I used to babysit for a woman that only bought flat meat (chops, steaks, chicken breasts) because they were neater in the freezer. That is going in a book somewhere. The same woman also planned her errands so she never had to make a left turn. You can't not put those into a book somewhere! Mainly it is the allergy thing. Now I am ocd about what my neighbors think lol! Well, I think my neighbor may be OCD...but perhaps he has allergies,too, although pretty everything is dead around here because of the cold weather we have. Plus, I'm sure you don't vacuum outside early on Saturday mornings! In less odd habits and traits--I had a customer who I wrote into one of the villains of my last story. What thoroughly enjoying observations about people's foibles. Loved the Patio Guy and Flat Meat Lady. Elizabeth Hein, you described my mother who was so afraid of making a left turn she planned her trip so she wouldn't have to make any. BTW, did you read that UPS (or was it FedEX?) had their drivers plot their route so as not to make left turns to avoid wasting gas? Whether that's true or not is questionable. Wow, that's interesting. Because making left turns means a little more waiting? That's one of my favorite phrases too, though like you I try not to write my friends (or enemies) into my fiction. Though I am contemplating writing a YA series based on a game we played as children.. Insecure about characters: absolutely, yup. I'm not sure that the vacuuming DOES matter at all, but it establishes the character who does it quickly. He's a very sweet guy, but a little OCD. There's this one guy behind my building who uses his leaf blower on his driveway WHEN THEY'RE ARE NO LEAVES ON THE GROUND. Sometimes I wonder if he knows what the leafblower is used for. Hahahaha! So he just stands there with his leaf blower blowing hot air around? Weird! Haha! Maybe it doesn't matter WHY he vacuums his yard. He just does? Characters are my favorite thing too. All my stories start with them. I still get insecure because I often just let them be the way they are without assigning a reason. Do we need a reason for everything?! Now, I'm more insecure. Yeah, I think he just does. *shrugs* Most of my stories begin with a character. You know, I used to just write whatever into a character, then I had writing teachers who were all, "there has to be a reason!" I disagree! I probably won't use it but I sort of wrote this experimental futuristic novel where I wind up in the novel (toward the end, in one scene) and it kind of weirded me out. It's me, but not me, because it's my "future self" and I was thinking - what if this sci fi novel (or something like it) were to happen and I were in that future - what would I say. =D That's the weirdest one I've done yet. I have a hard time remembering to vacuum indoors. I'm sure there's a rational explanation for your neighbor. Happy IWSG Day and Happy writing! So far, in this novel, there is Vacuum Man and one character who might resemble a childhood friend, but not really. I like the sounds of that sci-fi story, though! Thanks for stopping by! I think it's great that he vacuums outdoors. The fun part is finding out why. Like you said, is it OCD? Is he trying obsessive with keep his porch clean? Or does it stem from something deeper? Did his parents do this? Does he need an excuse to see a hot neighbor? I LOVE this little quirk (and any of these real life quirks) it makes your characters way more dimensional. I think in my story, at least, I might leave it up to the readers' imagination. Recently, I added a bit of my coworker into a story. She loves music and tends to say "I love this song." for every song, so in a story I have a character doing just that. I let my coworker know too and she thought it was great. Oh, that's a good thing to give to a character. I know someone who says that a lot, too. Interesting character you've created. I'm guessing he probably likes to vacuum because he doesn't like to do the laundry or the cooking. :-) Then again I'll wait until you finish the tale. All the best! There are some stories where the characteristics of some people I know enter the scenes. If it's good, I let them be. If not, I'll think of another thing that would be suitable. Thanks for the blog visit! I haven't really decided why he vacuums outside, but I'm sure Nicole will ask Darius about it when she knows him better. Thanks for coming by! I think a mix of character traits, some taken from real-life and some just made up, is the way to design interesting characters for our stories. You should interview your character, to find out why he vacuums outdoors. You never know what you'll discover, that will take the story in a totally different, but interesting, direction. I might just do that. Apparently, he's trying to quit smoking. I don't think that has anything to do with neat freak tendencies, but who knows?